Last week, I wrote about the spouse of one of my ancestor’s siblings, and I have decided to do this again this week. I have chosen Joseph Bannister Stow, the husband of my great grandfather’s sister Elizabeth Whimpey. Joseph Bannister Stow, of Maldon, brewer. 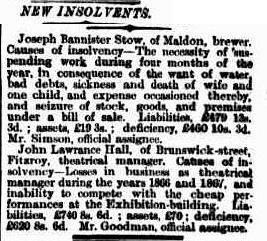 Causes of insolvency- The necessity of suspending work during four months of the year, in consequence of the want of water, bad debts, sickness and death of wife and one child, and expense occasioned thereby, and seizure of stock, goods, and premises under a bill of sale. Liablities 479 13s 3. ; assets 19 3s. ; deficiency, 460 10s 3d. Mr. Simson, official assignee. When Joseph had married Elizabeth Whimpey, he was a widower, with 3 living and 3 deceased children. The wife mentioned in the above article was his first wife, Mary Ann Fitzgerald, and the child mentioned was their daughter Jane. Mary Ann died 10 April 1866, and Jane was born and died in 1866, so it seems that Mary Ann died due to complications of childbirth, with the child also dying. Tragedy had struck Joseph twice before his first wife and Jane’s deaths. His daughter Clara had died 12 January 1862. CHILD BURNT TO DEATH THROUGH PLAYING WITH MATCHES. 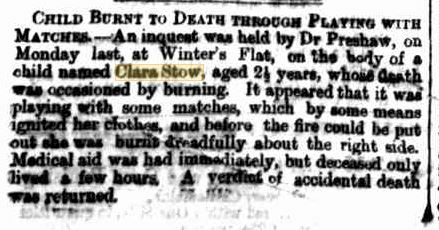 – An inquest was held by Dr Preshaw, on Monday last, at Winter’s Flat, on the body of a child named Clara Stow, aged 2½ years, whose death was occasioned by burning. It appeared that it was playing with some matches, which by some means ignited her clothes, and before the fire could be put out she was burnt dreadfully about the right side. Medical aid was had immediately, but deceased only lived a few hours. A verdict of accidental death was returned. Joseph and Mary’s son Charles Fitzgerald Stow died just 2 weeks later, on 25 January 1862, from thrush and diarrhoea. Joseph and Elizabeth moved from the Castlemaine area in Victoria, to the Newcastle area in New South Wales, between 15 October 1875, when daughter Harriet was born at Campbell’s Creek in Victoria, and 2 November 1877, when son John was born at Newcastle, New South Wales. Mr. J. B. Stow, a well-known resident of Wickham, and founder of the Independent Order of Oddfellows in the Newcastle district, died at his residence in Hannell-street on Saturday morning. Although the deceased gentleman, who was 79 years of age, had been in failing health for some time, his illness did not assume a serious aspect until the evening of the 29th July, when he attended a social in connection with the Victoria Lodge, of which he was a member, and was compelled to return to his home. He gradually became worse, suffering great pain and subsequently died. When Messrs. Wood Brothers established their brewery in Hamilton, about thirty-three years ago, the late Mr. Stow, who came from Victoria, for a considerable time filled a responsible position under the then manager Mr. Cadell, but of late years he had been living a retired life. Shortly after his arrival in the Newcastle district the deceased, assisted by a few other members of the order from Victoria, scattered about in the various suburbs, took steps to institute a lodge of the Independent Order of Oddfellows in Newcastle,with the result that the Victoria Lodge, No. 2, was brought into existence. Mr. Stow, previous to leaving Victoria, had been a member of the Castlemaine Lodge, from which he obtained a clearance, and threw all of his activities into the newly-formed branch. He became the first secretary, and his knowledge of the working of the society proved invaluable to the brethren, who had no previous experience. He next turned his attention to the suburbs, and was instrumental in the formation of other branches. In whatever station he occupied in his lodge, he won the esteem and confidence of his fellow-members, who frequently elected him as their representative of the annual sessions of the Grand Lodge of New South Wales. That body also on many occasions appointed him as the district deputy grand master of some of the subordinate lodges in the Newcastle district. He was one of the first members of order in the State to be presented with the veteran’s medal for long and honourable services. The Grand Lodge also made him a monetary presentation, and on the occasion of his last attendance at the annual session, he was congratulated upon being the oldest member of the Order in the State, if not in the whole of the Commonwealth. At the time of his death, the deceased had been an Oddfellow for 55 years of which period he had been associated with the Newcastle lodge for over 33 years, labouring long and earnestly for its welfare, some of his last duties being the visitation of the sick members. In every position he filled he put his whole heart into the work he loved so well, and not only in his own lodge, but also in other branches he will be missed. His funeral took place yesterday afternoon, and was largely attended by sympathisers from all parts of the district. The procession was preceded by members of the Independent Order of Oddfellows, the pall-bearers being Bros. P. Anderson, P.G.P. Hillyer, PNG. H. A. Davis, N. G. and H. Harris. Bro. E Charlton, PG. of Lambton, represented the Grand Lodge, and Bro. W. Melene, the D.D.G.M. of Victoria Lodge, was the marshal. A short service was conducted at the house by the Rev. G. H. Hewitt, who also officiated at the graveside. The Oddfellows ritual was read by Bro. A. B. C. Nicol, P.G. The interment was in the Methodist Section of Sandgate Cemetery. The deceased is survived by his widow and a grown-up family of nine daughters and three sons, who have been the recipients of many expressions of sympathy.